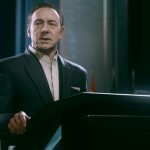 As the campaign launches on Sledgehammer’s first Call of Duty, the first thing that pops off the screen is the visuals. The facial capture in both the CGI cut-scenes and the real-time rendered visuals is absolutely astonishing. Although the protagonist (Mitchell) isn’t an exact replica of the voice actor Troy Baker, there’s enough of him in there for you to instantly recognise who it is. There’s clever usage of Troy Baker too, as Mitchell speaks throughout the game, but only in cut-scenes when you’re viewing the character in third person. When you’re playing through in regular first person view, your character won’t have any lines, as to not break the immersion. It makes for an interesting compromise. On the other hand, the much promoted use of Kevin Spacey is delivered as a lifelike carbon copy. Again, it’s really impressive – not only the level of detail in his facial textures, but also the mannerisms that have been captured. All his little micro expressions are picked up, for an ultra-realistic performance. There are moments when he doesn’t even need to speak, Spacey just looks into the camera and gives you that look, and it’s powerful stuff. 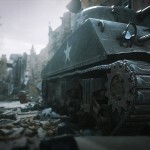 The transitions are also worth of note, as there are some perfectly smooth transitions that make it difficult to tell when game rendering ends and CGI movies begin. And Sledgehammer don’t mess about. You’re dropped straight into the thick of it, with a combat mission in Korea to set up some story aspects. It’s not until twenty minutes in, after Spacey’s introduction, that you reach the ‘Induction’, and it really gets going. After losing an arm during the first mission, the induction involves your character Mitchell calibrating his biotech limb and running training missions with the tweaked arm. It genuinely doesn’t feel out of place or break the immersion. 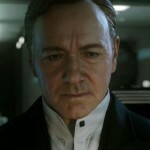 The mood throughout Advanced Warfare is mature, in a realistic modern setting. There’s enough depth in the story to keep you entertained through the six hours of single player campaign, and the mechanics are kept fresh with the Exo suit always providing something new, depending on the mission and environment. Sledgehammer have done something a little different with the pacing, too. Although there are no entirely unpredictable plot twists or surprises, the progression makes sense as the story is essentially split into two halves, with your character taking a journey of two parts, defeating one antagonist, then on to the next one. But we all knew who the real bad guy was going to be, the minute we saw that first trailer. Mitchell, Gideon, Cormack, and Ilona are your companion characters, with great facial capture and enough personality to make them real, Gideon especially, being your cockney-soldier buddy throughout most of the game. 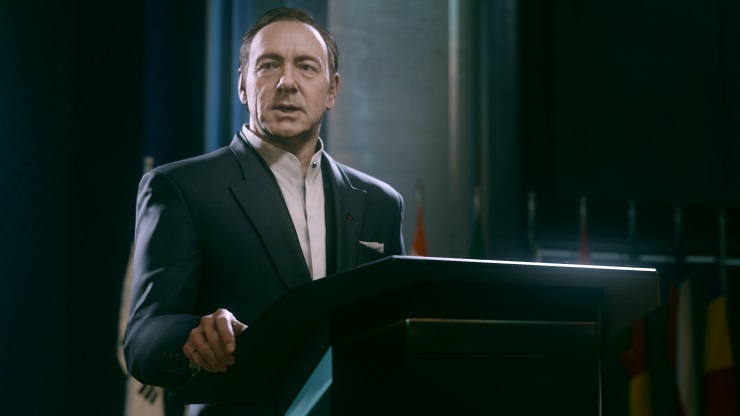 But everyone in Advanced Warfare takes a back seat to Spacey’s Irons, really. With all the other characters feeling like supporting actors, though not in a bad way. Ultimately, as the credits roll, you’ll feel like you’ve just played one hell of a Kevin Spacey movie. The sound design is especially worthy of note, as expected. The score by Harry Gregson-Williams and Audiomachine, along with the sound effects are what come together to truly elevate Advanced Warfare, without you even realising it. Simple touches, like the round-start music in multiplayer. It gets the blood pumping, ready for a hectic competitive session. With the introduction of the Exo Suit, Sledgehammer had to take multiplayer level design back to the drawing board. No longer would the typical three-lane approach suffice, so they had to create levels with a whole new dimension. The increased verticality is a nod to arena shooters of the late 90s like Quake and Unreal. 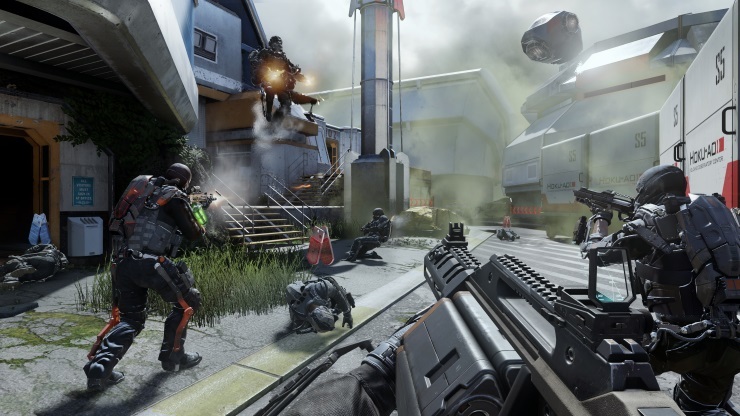 With the shooter genre moving away from ground-running combat and into a battlezone that uses verticality, games like Advanced Warfare and Titanfall are changing the way we play first person shooters, for good. 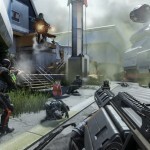 Advanced Warfare’s multiplayer modes are fast paced, but players seem to take a few extra bullets to die this time around, which will come as some relief to those that find themselves dropping too quickly. This essentially means players will stand more of a fighting chance to kill their attackers before they die, rather than dying on sight. 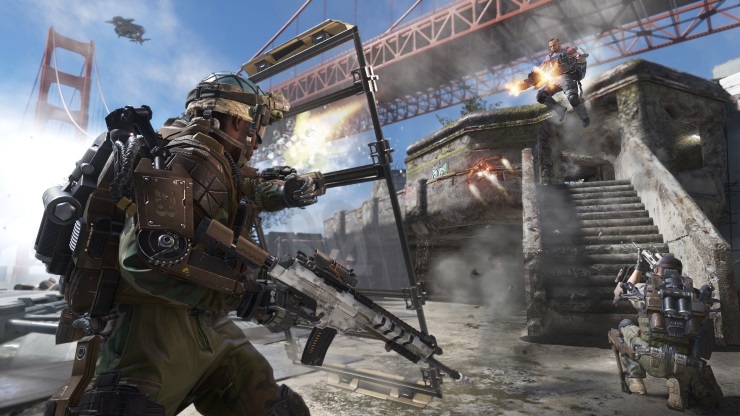 There are lots of improvements over previous Call of Duty titles in Advanced Warfare, not only in the gameplay mechanics, but also in the area of customisation. You’ll still have an Emblem and Player Card to represent your personal branding on the battlefield, but now your solider is totally customisable, too. Selecting a body type and gender affects how your soldier looks on the map, but the real clincher here is the customisable costumes. You’ll earn helmets, character gear, and exo suits from playing the game, in both single player and multiplayer. Completing challenges provides you with time-limited gear. For example, getting a certain number of headshots in a match will earn you the Bloodshed helmet, that only lasts for thirty minutes of game time. Therefore, if you see someone in your lobby with a Bloodshed helmet on, you had better keep your head down during that match. This kind of themed gear is going to prove extremely popular, and complementing the challenge-based gear is the Supply Drops. Anything gained from a supply drop is yours to keep. Once opened, a drop will provide you with a lucky-dip item. This could be a weapon, or character gear. You may not be able to use this item immediately, though, as supply drops can sometimes include weapons a few levels above your rank, as a kind of carrot-on-a-stick technique to motivate you to level up. Weapons gained from supply drops can also contain additional weapon attachments, that don’t use up points in your loudout. 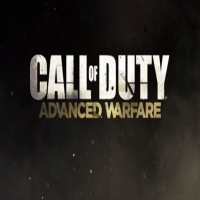 Setting Advanced Warfare in the near-future has also enabled Sledgehammer to introduce other new elements, as well as the Exo suit. Directed energy weaponry is one of the most fun additions. Instead of replacing more traditional projectile weaponry, the directed energy weapons are a great alternative option for your class loudouts. The TAC-19 shotgun (in particular) packs quite a punch and is especially entertaining to watch back on killcams. Based on Survival Mode from Spec Ops in Modern Warfare 3, Exo Survival is a wave-based cooperative multiplayer mode, where a team of 4 players go up against hordes of enemies. There are 25 rounds of differing enemy types and it can get quite intense. If pitting yourself against the COD masses isn’t your cup of tea, Exo Survival might be more up your street. Cooperative teamplay is encouraged, with three different class types, Light, Heavy and Specialist, each having different Exo abilities and weapon types. 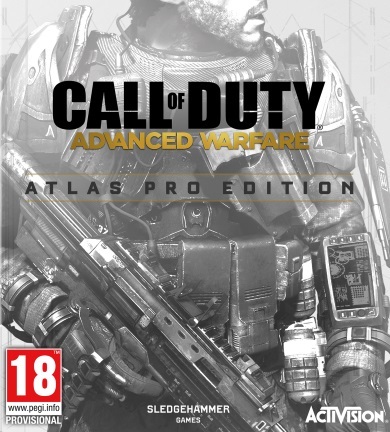 Sledgehammer have made some bold moves with their first Call of Duty title. 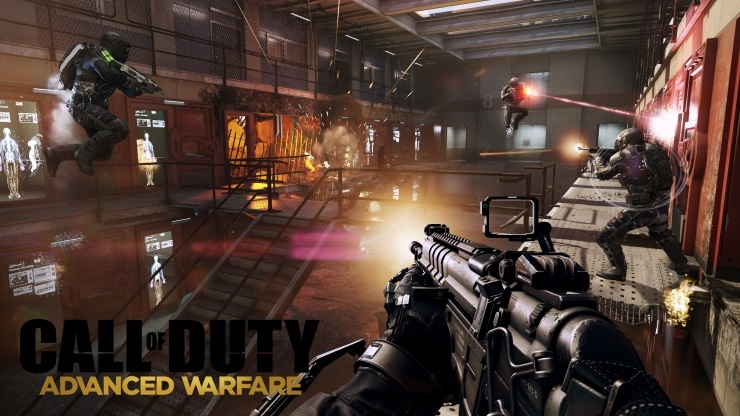 With the addition of a new dimension and brand new weapon types, Advanced Warfare’s multiplayer feels great. It’s fast paced, it’s smooth, and it feels rather well balanced. Add to that a genuinely compelling single player, and Advanced Warfare does enough to reignite anyone’s interest in the series. Review based on time spent at an Activision hosted review event, and further extensive home-testing with retail code provided by publisher.